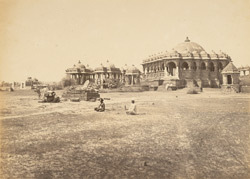 Photograph of chhatris at Bhuj, Gujarat, taken by an unknown photographer during the 1870s. The chhatris are the cenotaphs or funerary monuments of the Raos of Kutch, the rulers of Bhuj, and stood to the west of the town bordering the Hamirsar Tank. They took the form of domed kiosks or pavilions elevated on plinths inset with flights of steps. They were built of red sandstone and were richly decorated, though suffered damage in an earthquake of 1819. This is a distant view of a group of chhatris clustered round a larger pavilion.